Fun With Puzzles Brain Teasers Hidden Pictures Picture Puzzles Puzzles for Teens Word Puzzles Can you find hidden country names? 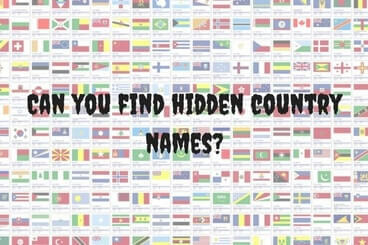 Can you find hidden country names? Some days back, I got a puzzles on Whatsapp in which some sentences were given and one has to find the country names hidden in the consecutive letters of the sentences. I find these puzzles very interesting and thought of creating few puzzles of this type in which one single sentence is given which contains the name of the country hidden in consecutive letters ignoring the punctuation marks. Country name PERU is hidden in this sentence. I posted these riddles in many different whatsapp groups and it was my classmate "Atul Bhandari" and my former teammate in World Sudoku Championship India team "Pranav Kamesh" who were very quick to answer all these riddles correctly. I have updated the answers of these riddles at the end of this post. Lets see how many one can solve. I will not be publishing the answers immediately as I want to see how many visitors of this blog can solve. Do come back to watch answers and do post your answers in the comment section of this post. 1. Jagmohan sat on his chair and started writing script of his next movie. 2. Can a day and night be of same duration? 3. In Diagonal Sudoku puzzle, numbers 1 to 9 appears on each diagonals. 4. SBI has at least one bank branch in all the big cities. 5. There is a big spa in Bangalore city. 6. Waiter picked up the money, which I left on the table. 7. He played music on GOD Krishna in temple. 8. Rajesh is puzzle blogger. Many people follows him on social media sites. 9. Fair and free elections makes strong democracy. 10. Ninja Panic is the name of the new Video game. 11. Three friends Tuchun, Gary and Anand were walking. 12. "Don't give Sermon, go liar", yelled angry mom at her husband. 13. She had a strong and malign influence. 14. Maltase is an enzyme, present in saliva. 16. World Chess Championship match was tough. Anand however looked calm and won first game. 18. Either put shoes on the rack, or each of you may get lost. Do checkout similar Riddles, Puzzles and Brain Teasers as listed below. 1. Fun Word Brain Teasers With Answers: There are many different types of Word Brain Teasers to test your English skills and tease your mind. 2. Picture Puzzles to find Hidden Words: Here are some interesting Picture Puzzles where some English words are hidden in the photo puzzle image. Your challenge is find all these hidden words in the picture. 3. What is next number in the sequence? : These are not purely English word puzzles however many of these puzzles require knowledge of English to solve these. In these brain teasers some sequence of numbers are given which follows certain pattern. Your challenge is to find the next number in the series. Below are the hidden answers of these riddles. Try to solve these riddles without looking at the answers and use these given answers to just check and correct your solutions.